Every single day I question why I’m doing this—why I’m leaving my funny, loving husband, our comfortable bed, my garden full of ripe, juicy tomatoes and abundant fresh water to walk and walk and walk. Come August I’ll be hiking from one end of Oregon to the other. South to north on the Pacific Crest Trail (PCT) for about 400 miles. Every object I need I’ll carry with me. 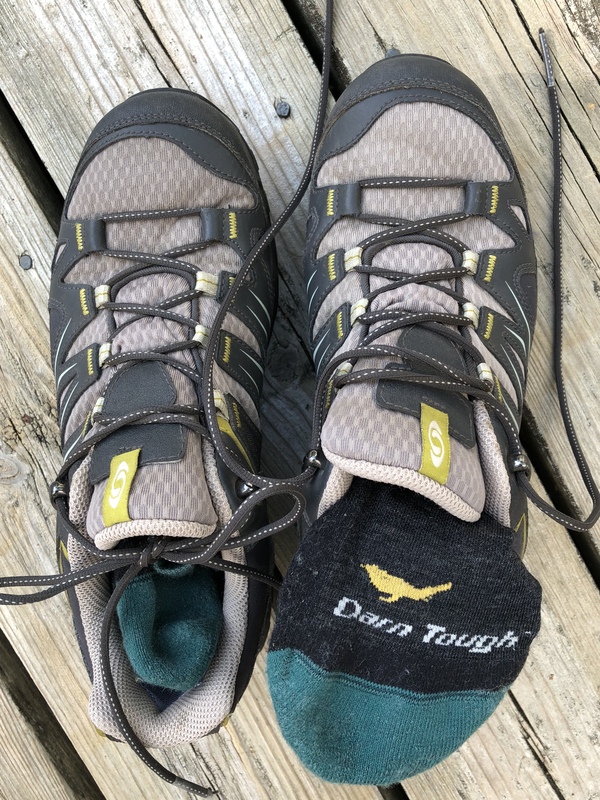 Fresh socks, clean shirts, raingear, food and snacks, a sleeping bag, a thin air mattress, an ultra-lightweight camp chair, a water filter, my Kindle and a notebook with a tiny set of watercolor paints. I don’t paint or draw, but this hike seemed like a good time practice and illustrate my travel journal. 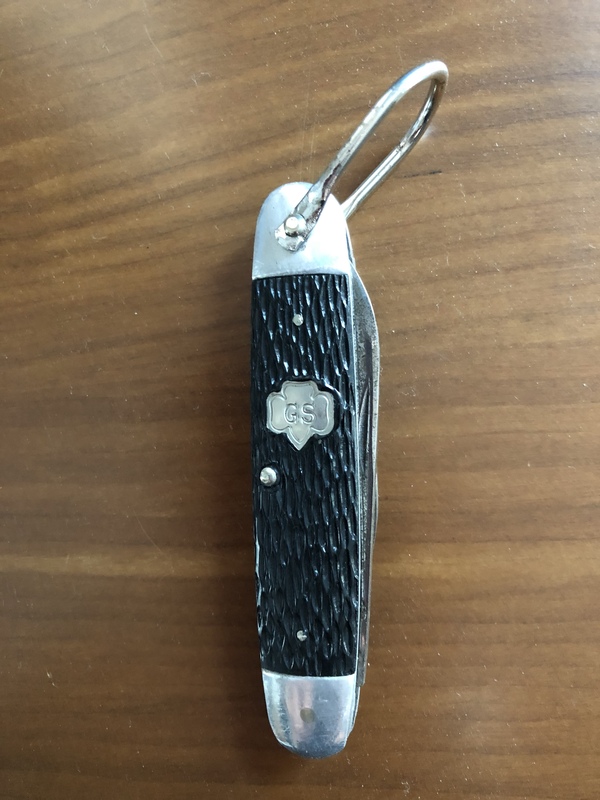 I’ve packed my vintage Girl Scout pocketknife, too. I was 16 years old the very last time I hiked and camped, and I hope to use it on this hike. If not, I’ll just carry it in my hand and feel the indented GS trefoil with the tip of my thumb and recall what first it was that made me love the woods. Taking on a big adventure like this consumes you. For the better part of a year, I’ve spent hours thinking about it, planning logistics, examining all the details of how to hike it, reading everything I can get my hands on, reviewing and gathering gear, and thinking about why this hike has come into my life. It is the PCT that I dream about every night, and it is what keeps me awake, too. The other day I was reading about how doing things that are new to you or are difficult, challenges the brain and helps activate pathways—creating brain plasticity. In this blog, the writer talked about how doing things that are difficult for you mentally are actually good for your brain. The logic in this blog resonated with me for a few reasons—the body and the mind become weaker when they’re not used. Our bodies were meant to move and our minds were meant to solve problems. When we don’t move, it’s harder to get started moving, and when we don’t think hard or challenge ourselves, we lose our mental sharpness. For me, hiking the PCT is as much a mental challenge as a physical one. Like anything we do that truly taxes the body, it equally taxes the brains—successful long-distance runners talk about how mental strength and physical training go hand in hand. A large part of that is having a rationale or a why for what you’re doing. I’m interested in how I react to the pure physical challenge of day after day of hiking. As a long time runner, cyclist and kayaker, I’m in “good enough” physical shape. I’ve upped my game this summer and stopped avoiding the hard stuff: the hills when I’m hiking or cycling, using the heavier weights at the gym on my legs, back and shoulders. I’m doing a couple of hours of something physically challenging every day until I leave. Among my many fears* is that I won’t be physically fit enough for the requirements of the hike—it’s unlike anything else I’ve ever done. My body is something I have some control over, so during the last weeks, before I leave, physical readiness is my priority. Hiking and camping was something I did back in the 1970s. I loved it then but didn’t carry it forward into my adult life. My memories of tent camping, hiking and being outside for days on end are vivid and always pleasant. I’m amazed by our natural world and the changes that one can see while walking and looking. I enjoy time outside hiking around Michigan seeing the changes in the environment, the landscape, the changing light, the flowers and the terrain. I can’t wait to see the stars at night in Oregon. I’ll learn about what I truly need day to day, outside of food, water and a place to sleep. My life has a lot of “extras” that I enjoy, but don’t necessarily need. This hike will help evaluate those things. I want to contemplate comfort and excess as I hike; carrying everything I think I need in my backpack. I won’t be hiking alone. I’m going with my friend Meredith. Mere and her friends did the much more difficult Washington PCT section a few summers ago, and when she came back from Washington and told me about her experience, I got fired up and told her when I retired that I’d hike Oregon with her. That was supposed to be around 2020-2021. Then, I quit my job and opened my own business. It seemed like now was a good time and we decided a year ago to do the hike this summer. I’ve always enjoyed solitude and much of this hike I’ll walk alone. Mere and I have practiced hiked a few times and we found a place where after hiking together and talking about all sorts of personal, spiritual and national issues, we take our lunch break we settle into a pace where she’s ahead of me (I should mention she’s less than 30 years old and is about 5’ 10” in height) and I follow more slowly. The solitude of running has always given me great ideas and creative insights—and I hope this hike will do the same. One thing I love about Mere, it that she’s unfailing positive and brings out the best in me. I can’t think of anyone else I’d do this adventure with—she gives me confidence, and she makes me laugh. One last why. It’s about facing fears. There’s a line in an Avett Brothers song: If you live in fear, you’re already dead. I don’t want to live in fear; I don’t want to believe I can’t do something big like this hike and I sure as heck don’t want to back down from life’s opportunities because I’m afraid of failing.